The story of Bekaert starts in Zwevegem, a rural village in Belgium, where local farmers are faced with the perennial problem of cattle showing the stubborn habit of straying beyond the boundaries of their fields so damaging other people’s property. Leo Leander Bekaert translates their need into a business opportunity: he starts up a small business in barbed wire by putting nails in twisted wire. Leo Leander Bekaert didn’t invent barbed wire, but he soon designs his own barbs: star-shaped ‘crowns’ with six sharp points which can be woven into the wire. In 1881 he patents this invention and, in next to no time, recruits most of the village to work at home making ‘crowns’ enabling Bekaert to continue producing at full speed. 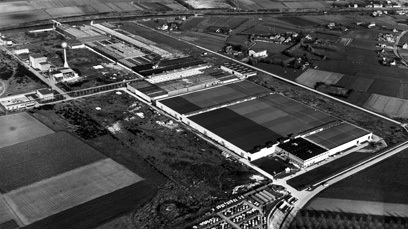 In the 1920s global expansion gives a new dimension to Bekaert. In the beginning of the decade Bekaert invests in a wire drawing mill in Bourbourg (France). Production starts in 1924, making wire products for the French market and French overseas territories. 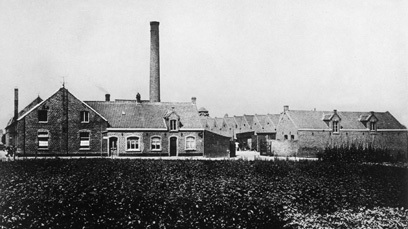 It is Bekaert’s first production plant outside Belgium. 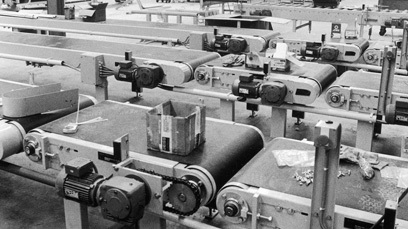 Throughout the years, Bekaert will never lose sight of the principle of keeping production close to the market. 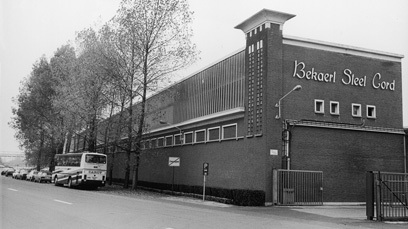 In 1928 Bekaert begins exporting to North America. A new kind of barbed wire – still produced today – is developed: Motto®, made of two relatively thin carbon steel strands twisted at a changing pitch between the barbs. The company celebrates its 50th anniversary. 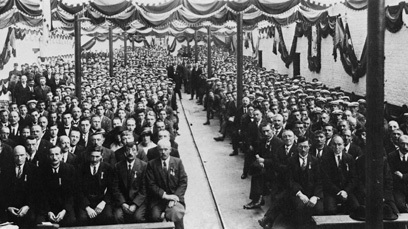 By this time, it is employing about 600 people (almost all of whom are on the picture). 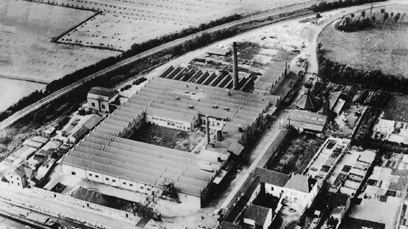 In 1932 Bekaert starts nail production in Zwevegem (Belgium). Bekaert further expands abroad with the investment in Tinsley Wire Industries Ltd in the United Kingdom. Several tire producers come knocking on Bekaert’s door asking whether we could make steel cord to reinforce rubber tires. Steel cord is a high tech product, consisting of very fine, mostly brass-coated steel wires that requires a highly capital-intensive manufacturing process. By the end of 1951 a team manages – after having overcome many discouraging setbacks – to make a few meters of steel cord. At the end of the 1940s Leon Antoon Bekaert – son of the founder – travels to Latin America. With this trip, he marks the start of the company on that continent. In 1948 Bekaert invests in Eltra (Argentina) and in 1950 in Inchalam (Chile). 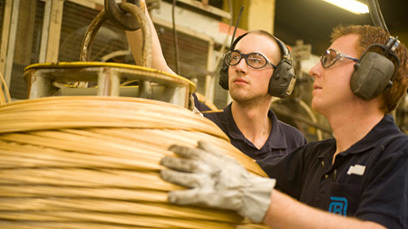 Steel cord production starts in Zwevegem (Belgium), where the first steel cord plant is built. An office is opened in New York (United States). Bekaert takes its first steps in Asia setting up a representative office in Tokyo, which is focused mainly on the steel cord business. Bekaert expands its business significantly into new activities and new markets. 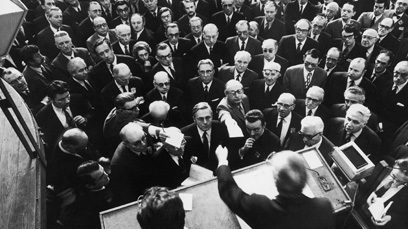 During the 1960s Bekaert opens different offices for example in Frankfurt (Germany), Paris (France) and London (United Kingdom). Bekaert broadens its activities in Latin America and invests in Vicson (Venezuela). Bekaert is – and has always been – a highly technology-driven company. 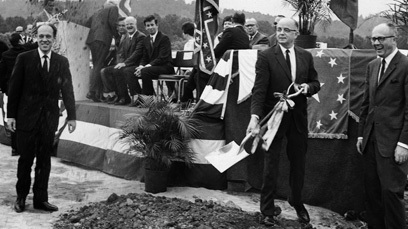 A major decision in this respect is the creation of a Research Centre in Deerlijk (Belgium) in 1964. It will become the cradle where over the years many breakthroughs in technology will see daylight, for example the development of thin metal fibers. Start of the engineering activity in Ingelmunster (Belgium). 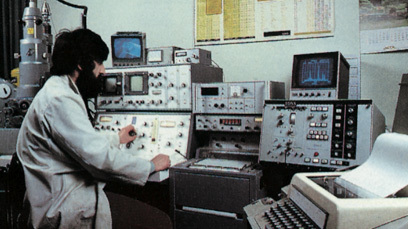 Engineering is (still today) responsible for the design and manufacture of equipment related to Bekaert’s businesses. Steel cord plant in Aalter (Belgium) starts production. In the early 1970s, the industrialized nations are rudely shaken out of their dream of a golden age by the first oil crisis. The second oil price shock, in 1978-1980 sends prices further up and leads to an international recession. One of the solutions to reduce the oil consumption of cars is to reduce the weight of the tires. That’s why Bekaert strives to make wires thinner and thinner and at the same time stronger. The approach is successful and the following years new steel cord plants are opened in Rome (United States), Burgos (Spain), Tochigi (Japan), Lanklaar (Belgium), Vespasiano (Brazil) and Moen (Belgium). The co-operation with the Japanese partners convinces Bekaert of the importance of Total Quality Management. Bekaert believes in it and applies TQM at every level and in every department. The Bekaert family, which until 1972 has all the share capital, decides to open it up to investment by new shareholders by listing the company on the Belgian stock exchange. In a little over 2 minutes, all the Bekaert shares are sold. The investments serve to support the expansion of steel cord and the progressing internationalization. 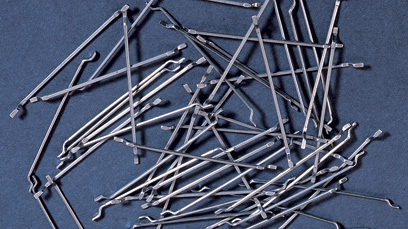 Bekaert develops Dramix® steel fibers for concrete reinforcement. Dramix® steel fibers offer many advantages: they are easy to mix into the concrete, they improve its ductility and they are more convenient to use in complex construction projects such as tunnels. 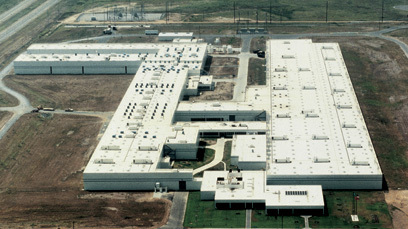 In the mid 1970s Bekaert opens a wire plant in Quito (Ecuador) and in Van Buren (United States). Bekaert announces the establishment of a Brazilian company, Belgo-Mineira-Bekaert, to manufacture steel cord for tires and for high pressure hoses. The company will come on stream by 1977. 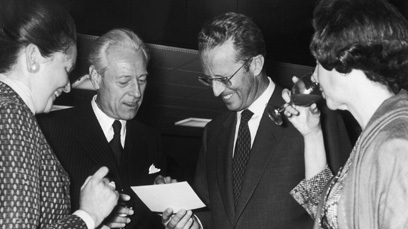 To mark Bekaert’s centenary, celebrations are held and his Majesty, King Boudewijn I of Belgium visits Bekaert. A visitor center is opened in the first Bekaert factory, built in the garden of the house of the founder. But 1980 is also the first year of what would turn out to be a tough decade. The second oil price shock – after the one in the early 1970s – sends prices up by a further 156% and leads to an international recession. The economic consequences are disastrous: inflation in the European Community climbs as high as 12.8%. Furthermore, industrial activity shrinks throughout Europe and the entire industrialized Western world. Following the difficult economic times in the early 1980s, Bekaert goes through important rationalization programs particularly in Wire Europe, aiming at creating product-dedicated plants, fostering higher flexibility and effectiveness, and paving the way for technology renewal. Bekaert also decides to work on diversification in e.g. composite materials and non-ferrous forged products. Bekaert introduces a range of new products and applications, e.g. 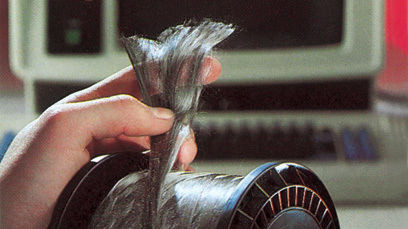 different types of fibres for filtration with diameters in the range of microns. While restructuring operations are held in Zwevegem (Belgium), Hemiksem (Belgium) and Fontaine-l’Evêque (Belgium), the steel cord capacity in many plants is significantly increased, based on rising demand for radial tires. Diversification projects are defined in specific areas, such as filtration and composites. Introduction of ‘Bekaert Values and Goals’, with the emphasis on market leadership, technological leadership and profitability. 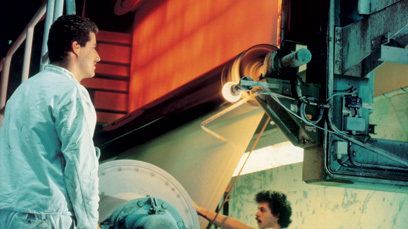 Bekaert moves into sputtering, an advanced process for applying vacuum coatings. 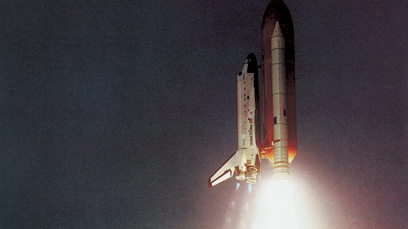 Bekaert metal fibers are used in the Space Shuttle’s heat shield. Diversification becomes a long-term priority and the focus shifts back to traditional activities. Three new steel cord plants are opened: Geelong (Australia), Dyersburg (United States) and Izmit (Turkey). Bekaert also acquires Muskegon Wire Cy (Michigan, United States) and holds in Taiwan a majority interest in a joint venture with China First Steel Ropes. To develop applications for metal fibres in burners Bekaert and Shell form a joint venture Acotech NV. 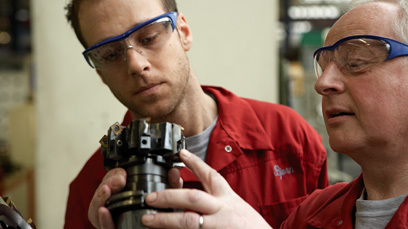 During the 1980s Bekaert invests massively in Total Quality Management. Hundreds of employees are trained as TQM project leaders, applying a strong problem solving methodology for continuous process improvement. A lot of plants apply for a Quality Award. Top management investigates core competencies and defines mission statements. Workshops emphasize the importance of value creation for the customer. In 1988 Bekaert is the first Belgian company to join the newly formed European Foundation for Quality Management (EFQM). New wire and steel cord plants are opened in the United States (Shelbyville -Kentucky, and Rogers - Arkansas) and in Belgium (Moen). 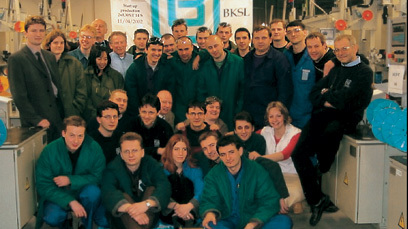 By 1990 Bekaert is a truly international company employing some 15 000 employees. Bekaert recognizes China’s huge market potential and decides to invest in mainland China, in the first place to take a substantial portion of the growing domestic steel cord market. The first steel cord plant in China, China-Bekaert Steel Cord (CBSC) is opened in Jiangyin (Jiangsu Province). It is a majority participation in a joint venture with local industrialist Fasten Group. 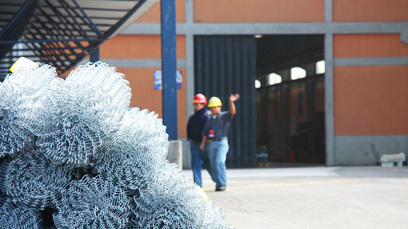 Bekaert expands its wire activities in Latin America with the acquisition of Prodinsa by Inchalam (Chile), the investment in Prolansa (Peru) and the construction of a second steel cord plant in Brazil. The Engineering activities are concentrated in Ingelmunster (Belgium). In amongst others China and Brazil local branches are set up to support the local steel cord operations. Bekaert takes a 45% participation in the wire activities of Companhia Siderurgica Belgo Mineira in Brazil. Later, the joint venture will be named Belgo Bekaert Arames Ltda. The partnership is a major step in Bekaert's expansion strategy in Latin America. Bekaert’s focus in Asia is not on China only. In 1997 operations are set up in Karawang (Indonesia) and in 1998 in Pune (India), to cover the fast growing steel cord markets. The company also opens its second steel cord plant in China in Shenyang (Liaoning Province). Bekaert also invests in Contours (United States) which produces profiled wire. Bekaert significantly expands its fiber activities, with the start of production of filter systems and envrionment-friendly metal fiber burners, used for paper drying and other applications. The company also acquires a majority interest in Furigas, a dutch company which specializes in environment-friendly gas burners. Bekaert enters 2000 ready for a new millennium, as a technology-driven business with proven competencies in metal-forming and surface coating. The company further invests in amongst others wire manufacturer Titan Steel and Wire (Canada). For the first time a Chairman of the Board from outside the family is appointed, Baron Buysse CMG CBE. Bekaert breaks into the market of window film for safety and solar-control applications by acquiring the Specialty Films unit of Material Sicences Corporation (MSC/SFI) in the United States. 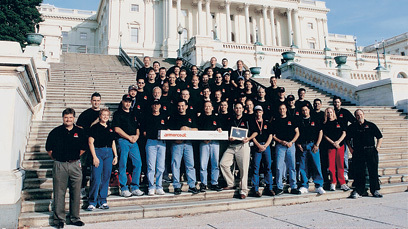 In the wake of 9/11, the windows of the Capitol in Washington are protected with Bekaert safety film, a project for which the team was honored by the Architect of the Capitol. In 2002 Bekaert celebrates the 50th anniversary of its steel cord actitivities. With 700 million euro sales of steel cord, bead wire, high-pressure hose reinforcement wire, conveyor belt cord, Fleximat® and fine wire, the division is the uncontested world leader in its market. The start-up of a modern new steel cord plant in Sládkovičovo (Slovakia) proceeds smoothly. Bekaert acquires two wire mills in Slovakia. The company also plans and transfers some steel cord products, mainly intended for project markets, from Zwevegem (Belgium) to Slovakia. 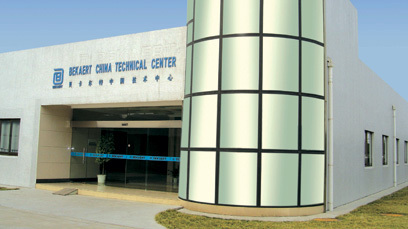 Bekaert experiences explosive growth in its steel cord activities in China: an extension to the Shenyang plant (Liaoning province) is opened while the third steel cord plant in Weihai (Shandong province) is constructed and a Technical Center in Jiangyin (Jiangsu province), with state-of-the art facilities for testing polymer tire reinforcement is opened. The company also inaugurates the first steel cord plant in India, in Pune. 2005 is the year in which Bekaert celebrates its 125th anniversary and launches a new corporate identity and a baseline better together. The baseline is highlighting the increasingly customer-focused business culture and conveys the progress towards more open communications, better cooperation, wider share ownership and even greater concern for corporate governance. 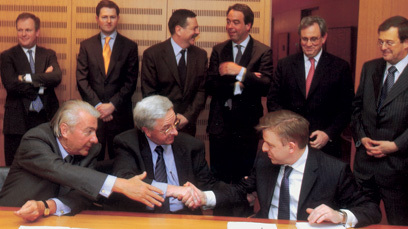 In January 2005, Bekaert took the decision to sell Bekaert Fencing NV. 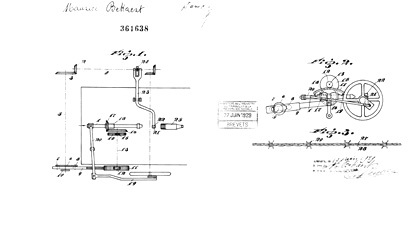 The sale was a historic event, because the fencing business was the business in which Bekaert has started in 1880. The BRIC countries – Brazil, Russia, India and China – are playing an increasingly important role in the growth of the world economy. 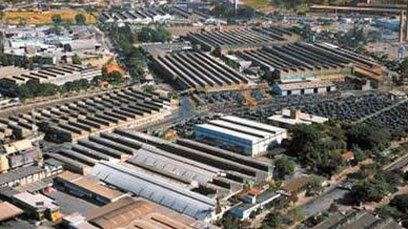 Bekaert, present in Brazil via joint ventures and in India and China with its own production plants. The company opens two new plants, one in in Shenyang (Liaoning province) and one in Jiangyin (Jiangsu province) and advances its market position in China significantly despite the heightened competition. Bekaert presents strong results, based on a global presence and on unlocking the potential in both the traditional and emerging markets. Placing emphasis on sustainability the company optimizes its portfolio and production processes in the interests of people, the environment and the community. The Research & Development budget raises to 60 million euro to ensure that Bekaert achieves or retains the status of preferred supplier for our customers around the world. Supplementary to its partnership with Fasten Group in China, Bekaert also concludes a partnership with Ansteel, a leader in the Chinese steel industry and one of the world’s top steel producers. Together both companies will explore strategic cooperation projects in order to address more effectively the growing demand for advanced wire products on the Chinese market. In Russia Bekaert decides to secure a manufacturing presence by building a new steel cord plant in the Lipetsk region. The new plant will make Bekaert even more global and will open up new opportunities for the future. Bekaert further consolidates its activities in Latin America by establishing together with its Ecuadorian partners a holding company, Bekaert Ideal, which includes both partners’ interests in Venezuela, Ecuador, Colombia and Peru. Bekaert is the principal shareholder in this new holding company. On 8 April 2009 Ansteel, a Chinese steel industry leader, and Bekaert officially open a new production plant for steel cord products in Chongqing (China) named Bekaert Ansteel Tire Cord (Chongqing) Co., Ltd. Ansteel and Bekaert will invest a total of € 150 million in the new facility, which will take place in phases. The plant is geared to future growth in line with market demand. In 2010 Bekaert continued its growth path by expanding its presence in regions where industrial growth is predominant: we increased capacity in India, Indonesia, Latin America, Central Europe and Russia to meet the growing local demand. In the tire cord market we could further strengthen our position with the acquisition of 2 Bridgestone steel cord plants, located in Sardinia and in Huizhou (China), which were fully integrated in the course of the year. Bekaert stepped up its investments in technological leadership by opening a new technical center in Ranjangaon, near Pune (India) to support our local customers with enhanced technical services. In Jiangyin (China) we inaugurated a new state-of-the art building to accommodate our Asia Research & Development activities. In addition, we brought our efforts towards more environmentally-friendly manufacturing processes one step further with the inauguration of the greenest steel cord plant in Shenyang. To this end we pulled together the newest technologies for optimized energy conservation, reduced environmental impact and workspace comfort. Further strides were made in making our plants ISO14001 compliant throughout 2010. 2011 was a year with two faces. It started as a promising year with the best quarter results ever. Bekaert’s confidence showed in the continuation of expansion investments and in M&A projects to grow its wire activity platform in China. The Group sold its Specialty Films activities to Saint-Gobain. This divestment was a confirmation of Bekaert’s strategic focus on activities related to its core technological competences: steel wire transformation and coatings. Drastic business evolutions in the solar energy market came as suddenly as unpredictably and started impacting Bekaert's sawing wire activities as from mid-2011. The evolutions in solar energy markets created turmoil across the entire supply chain. 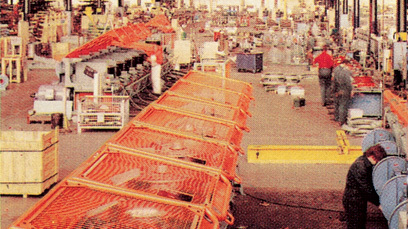 The resulting sawing wire business collapse compelled the need to rightsize Bekaert's related manufacturing and support platforms. This impacted Belgian and Chinese operations mainly. Bekaert also implemented an international program to reduce its global cost structure in order to restore the company's long-term profitability in view of continued sustainable growth. Bekaert further advanced the consolidation process in its Latin American activities and concluded a strategic partnership with Southern Steel of Malaysia to grow its business activities in South East Asia. Bekaert invested in a new production line at the company’s Lipetsk plant in Russia. Domestic production capacity of Dramix® steel fibers was added to serve infrastructure and construction markets in Russia and the wider CIS. The company sold its filtration activities to the American Clarcor Group and concluded a long-term agreement for the supply of filter media. 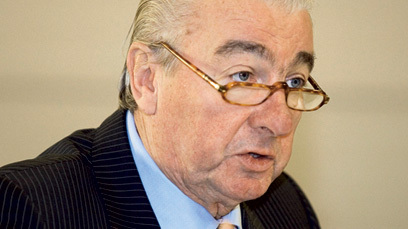 Bert De Graeve became Chairman of the Board of Directors in succession of Paul Buysse who retired after 14 years in the chair of the company’s Board. Matthew Taylor was appointed Chief Executive Officer and member of the Board of Directors, in succession of Bert De Graeve. Bekaert established a Dramix® steel fiber plant in Costa Rica to serve infrastructure and construction markets in the Americas. Bekaert acquired the majority of the shares of the ArcelorMittal steel wire plant in Costa Rica and took full ownership of the Cimaf ropes entity in Brazil. Bekaert acquired the steel cord activities from Pirelli. This largest acquisition in the company’s history includes plants in Izmit (Turkey), Figline (Italy), Slatina (Romania), Sumaré (Brazil) and Yanzhou (China). A long-term supply agreement is part of the transaction. Bekaert acquired Arrium’s wire rope business in Australia and established the Bekaert Rope Group with the company’s Chilean partners. Bekaert divested its Carding Solutions activities to Groz-Beckert. As part of this transaction, the companies entered into a long-term supply agreement of Bekaert steel wire to Groz-Beckert. Bekaert and Ontario Teachers' Pension Plan announce the merger of the global ropes and advanced cords businesses of Bekaert and Bridon. We expanded the scope of our global transformational programs and their impact has become clearly visible in our plants and in our results. We concluded the largest merger deal in the history of Bekaert and in the ropes market overall. The Bridon-Bekaert Ropes Group started business at the end of June. Beatríz García-Cos Muntañola was appointed CFO of Bekaert on 1 July 2016. 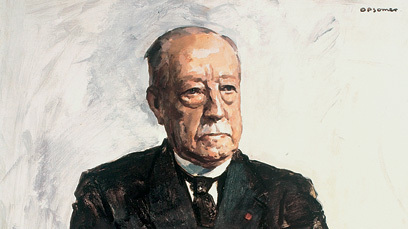 Bekaert opens new group headquarters in Belgium, built on the original grounds where founder Leo Leander Bekaert started the company in 1880.